Are bad times good news for the Securities and Exchange Commission? There exists a considerable debate in the literature investigating how stock market upswings or downswings impact financial market regulation. The present paper contributes to this literature and investigates whether financial market regulation follows a regulative cycle: does regulation, and consequently investor protection, increase as a result of a stock market downturn [as argued by, e.g., Zingales (J Account Res 47(2): 391–425, 2009)] or—contrary to the regulative cycle hypothesis—as a result of an upswing [as claimed by Povel et al. (Rev Financ Stud 20(4): 1219–1254, 2007), or Hertzberg 2003] Following Jackson and Roe (J Financ Econ 93(2): 207–238, 2009), we use funding data on the world’s most important financial market regulator, the U.S. Securities and Exchange Commission (SEC), as a proxy for the politically desired degree of regulation. We apply time series analysis. Using more than 60 years of data, we show that the SEC’s funding follows a regulative cycle: A weak stock market results in increased resources for the SEC. A strong stock market results in reduced resources. Our findings underline the downside of regulation as the regulative cycle amplifies the technical procyclicality inherent in regulation. The authors thank two anonymous referees, Johan Eklund, Martin Eling, Razvan Pascalau, Lars Petterson, Daniel Wiberg, participants of the workshop on Regulation, Entrepreneurship and Firm Dynamics in Stockholm, the German Finance Association meeting and seminar participants at Humboldt University Berlin, the Universities of Hannover, Potsdam, and Ulm and the Social Science Research Center Berlin (WZB) for valuable comments on earlier versions of the paper. Tim Linderkamp provided very valuable research assistance. All errors and omissions are our own. Bernanke, B. S. (2009). The financial crisis and community banking, March 20, 2009, http://www.federalreserve.gov/newsevents/speech/bernanke20090320a.htm. Accessed 30 August 2013. Bureau of Labour Statistics (2009). Consumer price index.. http://www.bls.gov/data/#prices. Accessed 30 August 2013. NYSE (2009). Facts and Figures, NYSE Historical Statistics, http://www.nyxdata.com/nysedata/NYSE/FactsFigures/tabid/115/Default.aspx. Accessed 30 August 2013. Peev, E. (2015) Institutions, economic liberalization and firm growth: evidence from European transition economies. 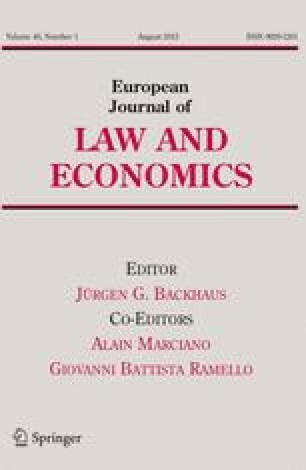 European Journal of Law and Economics. doi: 10.1007/s10657-014-9450-3. SEC (2001). Securities and Exchange Commission annual reports, www.sec.gov. Accessed 30 August 2013. SEC (2011). Securities and Exchange Commission annual reports, www.sec.gov. Accessed 30 August 2013. SEC (2012). Securities and Exchange Commission annual reports, www.sec.gov. Accessed 30 August 2013.